Perfect way to cross over the lushly meadows is to experience those serenity at the Garhwal Himalayas and camping in Gorson Bugyal can make your experience best. 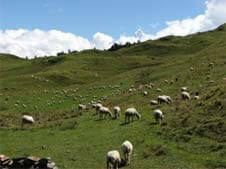 The finest charming green meadow of north India is actually high altitude grassy area of Gorson Bugyal. The green meadows of Gorson Bugyal is adorned with flowers in a spell binding varieties,which brings perfect mountain camping in Garhwal Himalayas. Tarpans are offered by the devotees at the small lake situated in the midst of the meadows. At a halt in Gorson Bugyal near lake a small temple is situated where devotees pay there prayers. The best ski slopes in terms of safety is Auli, and it is also known to be a skiers paradise,it has one of the longest skining slopes in Asia. The glorious view of towering Himalayan peaks such as Nanda Devi 7817 metres, the Mana Parvat 7273 metres and Dunagiri 7066 metre. Taking a leisurely 3 kilometre ride on cable car from Joshimath 1890 metres you can reach Auli. In Summers, Auli is the best destination for relaxation, where from its north the massive Alaknanda sleeping loudly and the unending grassy slopes all around, makes it the most relaxing hills resort in the Indian Himalayas! To experience the Gorson Bugyal camping tour large number of visitors visit this delightful destination in both summers and winter season. In summers from april to june is the ideal timings for camping at gorson bugyal, since in summers the green grass meadow bloom into a massive oasis of flowers after the spring thaw which provides the maximum adventurous and natural fun. At evening Reach in Joshimath, check in Hotel. Later at evening visit Shankarcharya Math & Narsingh Temple. Dinner & overnight stay. After breakfast, transfer to Auli by Ropeway (At your own). Auli is located at an altitude of 2500-3050 meters above sea level, and offers a panoramic view of Mt. Nanda Devi, Mana Parvat, Doonagiri, Bithartoli, Neelkanth, Hathi Parbat, Gori Parbat, Nar Parbat and Kamet. The snow dressed slopes of Auli are covered with evergreen conifers and oak forests. Check in Hotel. After breakfast trek to Gorson Bugyal (A big patch of green meadows) (03 kms / one way) it is a very beautiful trek altitude ranging from 2591mts to 3049 meters and we can see whole ranges of Himalayan's peaks on the way to trek. Enjoy Skiing activities. Dinner & overnight stay. After breakfast trek to Gorson Bugyal (03 kms / one way) it is a very beautiful trek altitude ranging from 2591mts to 3049 meters and we can see whole ranges of Himalayan's peaks on the way to trek. Enjoy Skiing activities. Dinner & overnight stay.